In a recent paper on NanoLetters, researchers of NEST Laboratory demonstrated localization and field-effect spatial control of the plasmon resonance in semiconductor nanostructures, using scattering-type scanning near-field optical microscopy in the mid-infrared region. 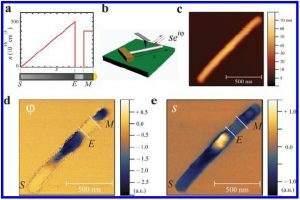 They adopt InAs nanowires embedding a graded doping profile to modulate the free carrier density along the axial direction. The near-field measurements have a spatial resolution of 20 nm and demonstrate the presence of a local resonant feature whose position can be controlled by a back-gate bias voltage. In their present implementation, field-effect induces a modulation of the free carrier density profile yielding a spatial shift of the plasmon resonance of the order of 100 nm. The relevance of this electrically tunable nanoplasmonic architectures is discussed in the paper in view of innovative optoelectronic devices concepts. Local plasmon resonance in a steep doping profile.